[3.0] HC/SC Nowlech's Trickster Essence Drain (LifeMoM/CI/LL) ~Shaper and Uber Atziri! Videos! Hi there! This is my Lowlife Essence Drain Build Guide! This build can do any content in the game, from when you get Essence Drain in act 1 to Shaper and Uber Atziri! I'm level 84 at this time, and I picked up "Walk the Aether" Ascendancy instead of "Ghost Dance" because I wanted a smoother mapping experience. Feel free to do that as well. I have done all the labs and on meh gear. I'm at 4.7k life, with 1.1k mana unreserved, since I took all of my damage nodes first, all I have left is to fill out life on the tree. Check down below for how I leveled this character in the spoiler tab called "Life/MoM Based Version - My 3.0 Starter"
these new gloves. Since we don't get life on there I might start respeccing out of some pure life nodes, and go for more hybrid ones like Written in Blood and Melding. Patch notes came out today, and I could not be more excited about this build. I AM starting with this build in 3.0, and will be updating/replying to comments almost every day. With the addition of adding power charges to the Swift Killer Ascendancy, and giving 5% more damage over time per power/frenzy charge, we are now taking that instead of Shade Form in all of the versions of this build. 8,000 Energy Shield is what we will probably be looking at on our LL Version, and 10,000 Energy Shield for CI, with better recharge rate as well - a huge loss yes, but we all knew it was coming. 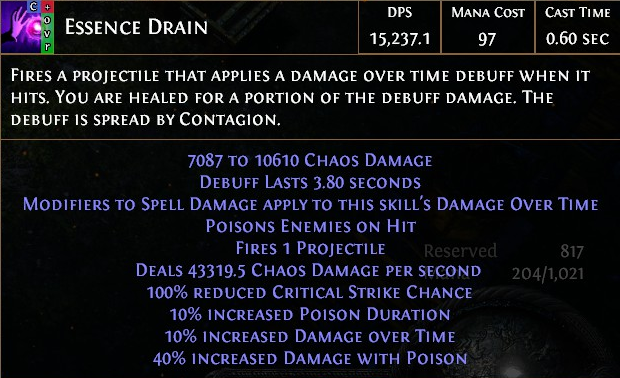 Essence drain got a 43% increase in damage, while contagion also got a buff in damage and AOE/faster casting. We got some new support gems and I will include those in the gem setup section. I am currently working on a life based version, and a more thorough CI version now. Sorry if I keep my map up, I'm not used to recording so just try to ignore it until I realize it. What's different with this from other ED builds? -I focused on being able to use whirling blades most of the time for getting around. So I made sure I got quite a bit of attack speed on my gloves and my dagger. -I wanted BOTH Damage and a High Life Pool/Life Regen. -Mind over Matter for our Life Version of this buiild. -Weave of the Arcane gives us plenty of mana to work with, a 25% increase which is huge. Enabling us to use 2 Curses and Arctic Armour. It also gives us insane mana regen, paired along with clarity, and you got free Whirling Blades and Contagions! Whenever you use a skill you have a chance to regain most of your unreserved mana, which is perfect for ED, since you want to spam ED to get poison stacks, and not worry about using a mana flask all the time. And just for an added bonus, it gives us 8% reduced damage taken for 4 seconds after using 200 mana! I have taken MoM with around 1500 unreserved mana for us to work with, and 166% Inc Life from the tree. I have dropped Vulnerability from Blasphemy and now we only get it from our Witchfire Brew. After the 85 Point tree, use the Final Tree Listed Above or respec into CI. Reduce damage taken by 8% if you have spent a total of 200 mana recently. Our most important Flask we use is the Witchfire Brew Stibnite Flask. We utilize the Vulnerability curse it gives us (a Level 21 Vulnerability makes cursed enemies take 33% more damage over time) and also gives us between 25-40% more damage over time. Try to get one with at least 35% damage over time. We use 1 Life flask. I like Seething Divine Life flasks of Staunching for instant recovery and of course the bleeding immunity. We use a Quicksilver flask for that juicy movement speed. Try to roll the suffix "of Adrenaline" for even more movement speed. And our last flask is one you can replace if you feel needed. I use a Basalt Flask just for a little more added defense, and again I rolled reduced charges so I can use it twice. And of course it is where we get our Freeze Immunity from. I will be respeccing into CI after a while from my 3.0 Starter once I have all the gear. I'm not even sure that CI is better than Life/MoM at this point, but I do want to try to see how the build works as CI now. Notice I don't wear an Eye of Chayula! That's because of the All New Pantheon System! There is a passive on the pantheon system that states "You cannot be stunned if you were stunned recently" (Recently refers to the past 4 seconds) Now that is up to you whether you want to rely on the Pantheon system. Currently we lose around 600-700 ES if we put on an Eye of Chayula with what I have in PoB. If it turns out to be a terrible idea, then I will change to an Eye of Chayula for sure, but as for now, I really want this Pantheon System Passive to work. For CI we drop Vulnerability from Blasphemy and grab Discipline instead. We still get our Vulnerability from our Witchfire Brew, but it's not up at all times now. The second most important flask is out Sulphur Flask. It gives up 40% more damage and it allows us to regen some health if we are standing in it's circle of goodness. Try to roll Bleed Immunity on this flask. -Of Spite (Releases a nova of projectiles, leaving chilling ground. Below you will find the information for the 2.6 Low Life Version of this build. I am not sure if it will even be worth going LL in 3.0 anymore due to how much ES got nerfed. I will build this in PoB and you can decide for yourself if you want to try it or not. It looks like, with TOP END and I mean, Exalts and Exalts worth of gear, it's worth to go Lowlife. If you just want to destroy every boss and have a decent amount of energy shield then yes, go lowlife. But as for now, it looks like LL is dead unless you have an insane amount of currency laying around. These are listed from most important to least. We use a Sai for the implicit only "6% Chance to Block"
Crafted with an Essence of Delirium until I got a good attack speed roll. Also you need to be able to have an open prefix to craft %spell damage if you didn't get it on the dagger Essence craft itself. Brinerot Whalers are our BIS but if you cannot figure out resists, High ES rare boots with a lot of resists are very good too. Brinerot only give us about 1.5k more DOT tooltip damage so don't worry about those until very late game. 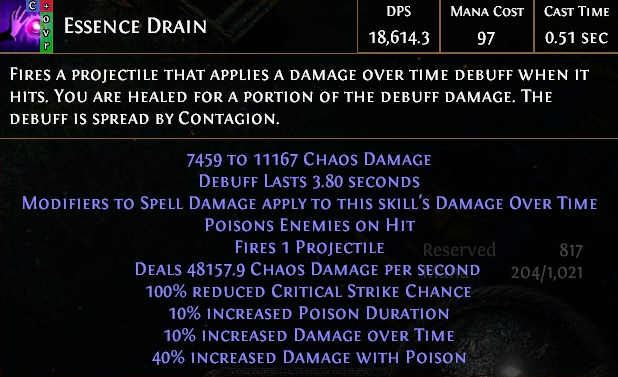 Presence of Chayula of course. Good amount of ES and Stun Immunity. What more can I say. FYI. Most of the time it is cheaper to buy the Blessing of Chayula and an uncorrupted Eye of Chayula, than to buy a presence straight up. You can either craft them yourself (not recommended) or just buy some with a lot of resists. Preferably with an open prefix so you can mastercraft on %Increased energy shield. Our most important Flask we use is the Witchfire Brew Stibnite Flask. The Curse it gives doesn't really do us much since we already run 2 curses, but it does give us more damage over time AND more evasion. Try to get one with at least 65% damage over time or more. The second most important flask is out Sulphur Flask. It gives up %40 more damage and it allows us to regen some health if we are standing in it's circle of goodness. Try to roll Bleed Immunity on this flask. We use a Silver flask for Whirling blades attack speed, and also cast speed always helps too! Try to roll either more charges, or reduced charges used, so you can use the flask more than once. 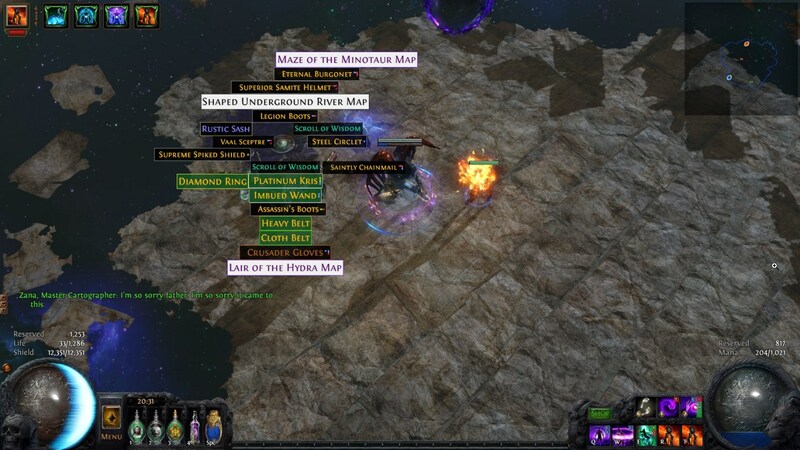 The Jewel socket next to the Shaper node is the thing you should be getting last. Updated and added Life and CI PoB Links and Tree Sections. Thanks for posting. 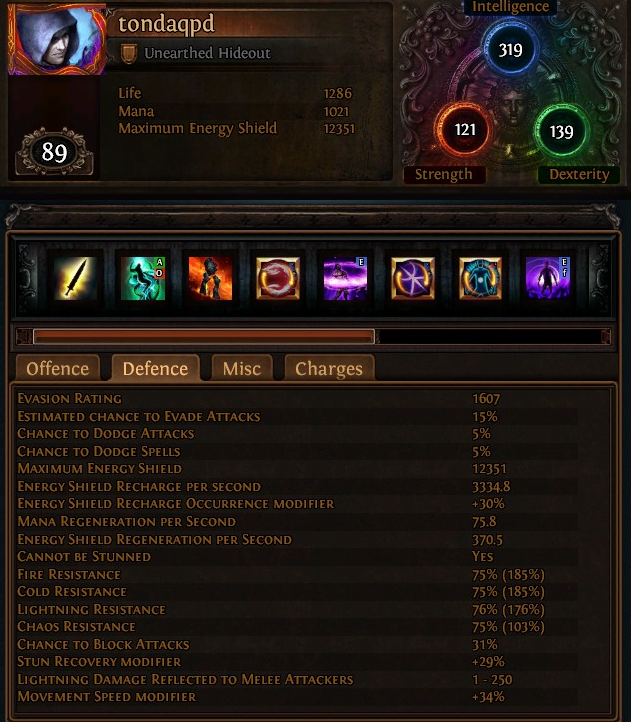 I've been following another Essence Drain build on what is essentially my first character. Up to 92 so far- but I got stomped by Shaper, haven't yet attempted Uber Atziri. I found your guide very thorough on a slightly different approach than what I had seen before so I'll take a shot making some changes based on what you wrote up! I am very happy with how this character performs. I took down Shaper and Uber Atziri at level 89, and have done them multiple times since then. I am going to upload an Uber Atziri later tonight or tomorrow! If you have any questions don't hesitate to ask here or PM me in game. Hey, first of all, nice guide. I just want to point out a few minor mistakes that might be confusing to some people. Blood Magic quality does not matter since you link it exclusively to auras. The reduced cost from quality does not apply to auras. There is also a mention of decay stacking, which does not work. Just thought I'd mention it so new players don't get confused. Keep up the good work! Thanks, Edited and fixed. I knew you couldn't stack decay so I have no idea why it was in there. But honestly had no idea about Blood Magic, so thanks for that! What would your gem setup be if you were to go CI? Id imagine that blood magic wont work with CI. What do you think about ES values changes in 3.0? Do you think it will be worth going CI/Low Life anyway? I actually started with an ES based character in the beta to see how it turns out in 3.0. It will still be viable for sure! I'm guessing with mediocre gear and a decently rolled shavs we will get around 7-9k ES. Which is fine with our ascendancy, since it recharges instantly, but we can't take a flameblast on Uber Atziri anymore (without a ruby flask) or just tank as much. Great, i hope ED will be ok. And by the way, when you don't have enough currency to buy a Shavs in first days of the league, you just go CI instead of low life?